Jordan Pickford was the calmest man in Samara after his man-of-the-match performance helped England to their first World Cup semi-final in 28 years. The Everton goalkeeper arrived in Russia not even sure he would start, but is putting together an unforgettable tournament, saving Colombia's fifth penalty to tee up England shootout success in the last 16 and producing three stunning saves to help see off Sweden in Saturday's quarter-final. Goals from Harry Maguire and Dele Alli did the damage in the 2-0 win, but without a hat-trick of one-handed stops in the second half, it could have been a different story. Yet the 24-year-old was the model of equilibrium as he collected the post-match award. "Nothing fazes me. The pitch is always the same: same lines, same goal height, same game of football," he said of arguably England's biggest win in his lifetime. "I just work hard every day in training. That's why I got a clean sheet tonight. All the saves I make in training are for showcasing them on a match day. "I never put myself under any pressure. I embrace the moment." There was only the slightest concession to the criticism which followed his failure to keep out Belgium's winner in the group stage - which included critiques of his technique and even his height. "Criticism doesn't affect me. It makes me even better," he said. "I always enjoy my football. Going out on the big stage makes it even better." 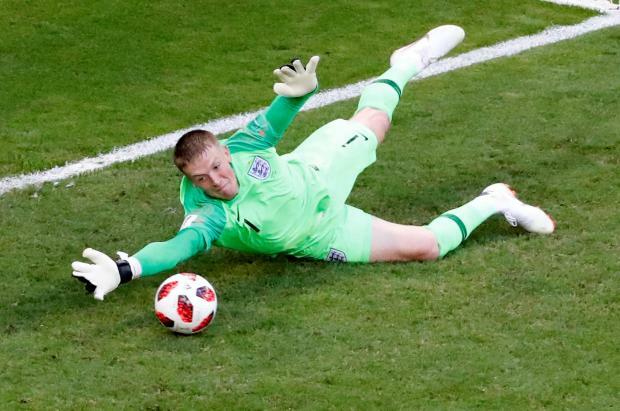 "Pickford, for me, is the sort of prototype of what a modern goalkeeper should be," he said. "His speed around the goal today, the saves he made at critical times and generally his distribution, there was some excellent moments picking out (Kieran) Trippier a few times with a reverse pass, able to play through the lines. "So, to be able to play the way I think we want to play moving forwards, we need goalkeepers of that ilk." Pickford also revealed he hurt his thumb when he attempted to thump the ground in a moment of frustration during the second half, but allayed any concerns over his fitness. "It was a daft injury by myself," he was quoted as saying by the Guardian. "I went to punch the floor and ended up punching my knee and hurt my thumb. It was a bit of anger. But I'm a man, not a mouse. I'm fine and I'll live another day, won't I?" Jordan Pickford was decisive in England's win over Sweden.